This was a luscious concert. 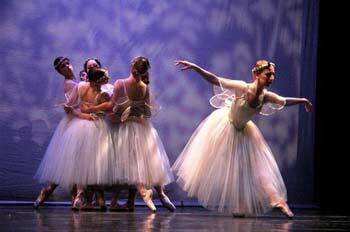 The costumes were rich with classic looks, both in "les Sylphides" and in "Serenade." "les Sylphides" is the 1909 Michel (Mikhail) Fokine ballet (often confused with the 1832 la Sylphide ballet, Paris opera). 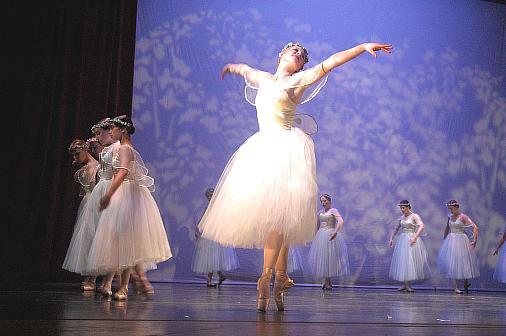 Fokine's ballet was a new, non-story ballet which was purely about dance using the idea of a sylph (mythical creatures of the air : from Greek for butterfly, sylpha) to bring the movements. "Les Sylphides" began in Russia where Fokine first developed it as a 1907 piece for Anna Pavlova called "Moonlight Vision." By 1908 it was expanded to a "romantic reverie," a suite of dances called "Danses sur la musique de Chopin." The next performance, February 1909, the handle was shortened to "Chopiniana." From there it moved to Paris on June 2, 1909 in the Theatre du Chatelet where it was named "Les Sylphides," the name it retains. Fokine began the work in 1907, when he choreographed a short piece called 'Moonlight Vision' for Anna Pavlova to perform in a Maryinsky Theater charity performance in St. Petersburg. The next year, he expanded it into a suite called 'Danses sur la musique de Chopin.' In February 1909 he presented a revised and enlarged version under the title 'Chopiniana' at the Maryinsky. Three months later, with a different overture and the new title 'Les Sylphides,' it premiered in Paris as part of the historic first season of Diaghilev's Ballets Russes de Monte Carlo. Ben Biswell and Anna Acker are featured in this piece and manage some of the prettiest moments. They are really nice, from a photographer's perspective, to shoot because they are so well formed in their movements. Anna is literally hard to shoot a bad picture of because she is so consistently perfect in foot, arm, leg, posture, etcetera. 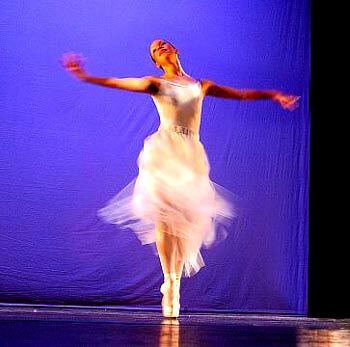 You may have to throw out shots because of your own shooting problems (late, blurred, out of focus, viewpoint and more) or because of the positions of other dancers, but not because of this dancer. 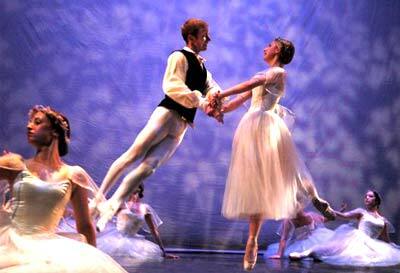 "Serenade" (sar-uh-nahd) is a lovely celebration of ballet's beauty. Mary Marshall (sophomore this year, from Overland Park) is a soloist in this piece. 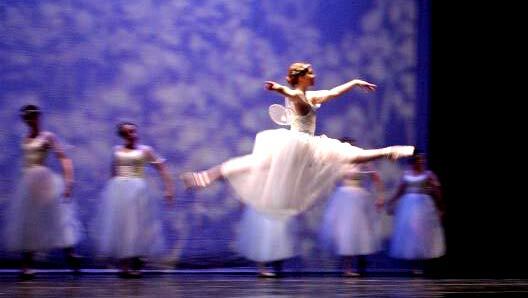 She comes out of Culture House and is an emerging ballet talent. Mary is another one who is great to photograph because she always seems to have well-formed position. A feature was the return of Winston Dynamite Brown to perform in Aureole. Winston is from Kansas City. He is on the road with Paul Taylor 2 and was picked a year ago (May 2005), along with Latra Wilson, to join Paul Taylor's company. Winston had learned the Aureole role last year for the spring UMKC concert. 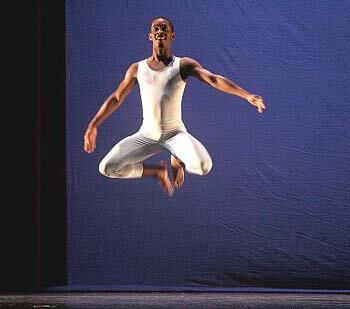 He had graduated in 2004 from UMKC's dance department. Latra graduated in 2005. They are a couple and were both hired by Paul Taylor for the number two company. Video captures: Left, Winston, fresh into town, and Rachel Barnes practice in the two hours before performance. On the right, Rachel and Winston in performance. I shot video for the conservatory of the friday performance (I had to shoot elsewhere on saturday) and I really got into Aureole this time in a way I had not gotten into it last year. Perhaps because Winston has had a year now to work on the Paul Taylor repertoire, or perhaps because the company had to "listen" more closely to everyone because Winston had to fly in at the last minute, practice just prior to the show and then step into a spot reserved for him by Chris Page (shown below) who trained as stand-in for the role. Anthony diCarlis was originally to have trained for this part but the death of his grandmother which required his travel back to NYC at the crucial part of the training schedule required Mary Pat Henry to reach out to Winston. As it turned out this year's performance of Aureole was especially alert and carried a type of infectious joy which let you really see what Taylor created with this dance. See Nicole's review (below the pictures on this page). The eight dances in the "les Sylphides" suite. 1. 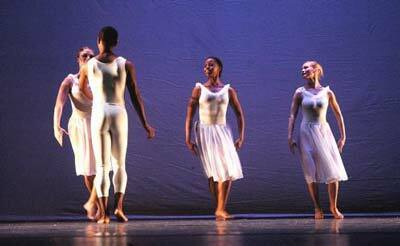 Prelude: The curtain rises and all dancers are on stage, posed motionless. 2. Nocturne: an ensemble danced by the whole cast. 3. 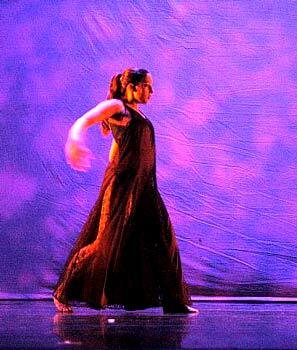 Waltz: a solo variation performed by a soloist. 4. Mazurka: a solo by the prima ballerina. 5. 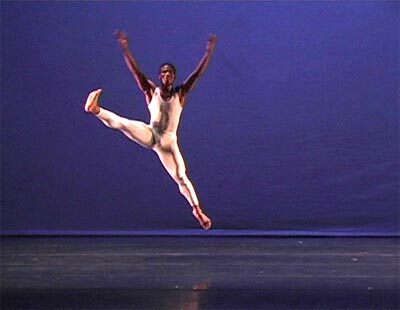 Mazurka: a solo by the lone male dancer in the cast. 6. Prelude: a solo by a different soloist. 7. 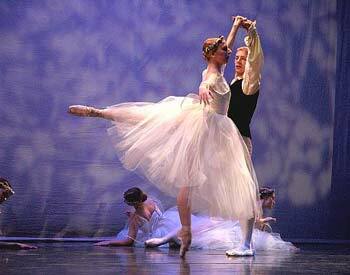 Waltz pas de deux for the prima ballerina and the poet. 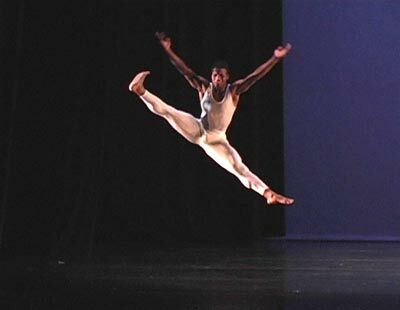 Video-capture frames of Winston Dynamite Brown during a series of leaps across the stage from right to left (stage left to stage right). They start with the picture on the right and move to the one on the left. 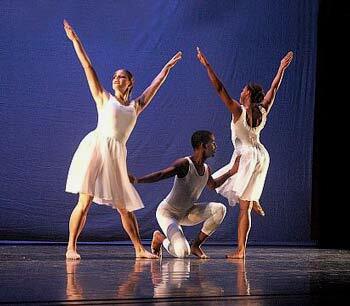 Spring Concert, April 7-8; Friday/Saturday, 7:30pm White Recital Hall. Friday and Saturday, April 7-8, the Conservatory kicked off its 100th Anniversary celebration with the Dance Division's Annual Spring Concert. In honor of the 100th Anniversary, the Dance Division proudly presented its most professional pieces to an almost full-capacity White Recital Hall audience. 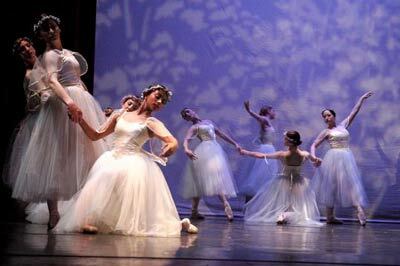 The show opened with a stunningly beautiful performance of Michel Fokine's classic ballet, "Les Sylphides", set to the music of Chopin. 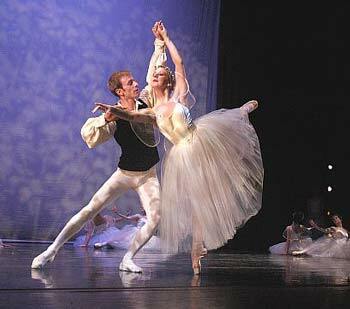 The ballet had been staged for the Conservatory in 1957 by the Dance Division founder, the late Tatiana Dokoudovska, dance professor emeritus, who had danced with the Ballet Russes de Monte Carlo in her youth. The costumes for the performance were generously loaned to the Conservatory by the Kansas City Ballet. Anna Acker, Tia Birdsong, Benjamin Biswell, and Molly Wagner adeptly danced the principal parts. The entire company did a remarkable job in bringing this classic ballet to life. The next piece up was the repeated performance from last year of the Paul Taylor suite, "Aureole", set to the music of Handel. The performance of "Aureole" was made possible as part of the outstanding relationship the Conservatory Dance Program has with the Carlsen Center. The Carlsen Center, under the artistic direction of Charles Rogers, and the Carlsen Center ARTSEducation, under the direction of Angel Mercier, at Johnson County Community College have made the performance "Aureole" at the Conservatory possible. Additional funding was also provided by the Muriel McBrien Kauffman Foundation to promote partnerships in the local dance community. Without their support, this performance, and the students' experiences, would not have been possible. "Aureole" featured the performances of the cast from last year's presentation of the piece, including Rachel Barnes, Ronald Belger, Michele Cox, Stephanie Ruch, and of 2004 alumnus, Winston Dynamite Brown, who was brought in as guest artist from the Paul Taylor II Company, where he now performs as regular member of the company. This year's performance of the piece, however, showed much improvement in mastery of the material. 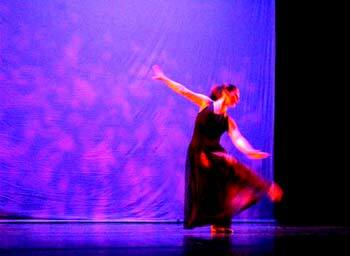 "That was amazing," said Paula Weber, a member of the Dance Division faculty, after the piece ended. "Winston had so much more extension in his moves this time," said Conservatory grad student, Christina Walker, about Brown's dancing. "It was like a whole different performance.... he seemed more into this time, the moves seem more a part of him... he probably has a better edge on interpreting the choreography since now he is dancing full-time with the Paul Taylor Company." Ironically, Brown was not originally planned to reprise his Paul Taylor role in "Aureole" this year. It was originally cast with Anthony DeCarlis for this concert. Unfortunately, DeCarlis had to give up the role when his grandmother passed away and he was compelled to return to New York City for the funeral and to take care of family affairs. Brown was then contacted to reprise his role from last year. He agreed without hesitation. He was happy to do the role again at his alma mater. "Additionally, now that I am with the Paul Taylor Company, I am immersed in the Taylor style, so it feels more natural to me now... like the inspiration for the move comes from the inside more... feels different... the role feels better in performance for me now... more a part of me." Following intermission, the concert opened with the George Balanchine, "Serenade" (First Movement), performed to the music of Tchaikovsky. This ballet was Balanchine's first American creation, and was original envisioned in 1934 to be a classroom project for students at the School of American Ballet in New York. In Balanchine's hands, however, this piece was the beginning of what was to give birth to the American form of classic dance and was to guide a succession of companies, culminating in what is now known as the New York City Ballet. 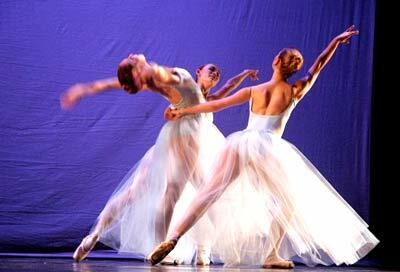 The copyrighted Balanchine Ballet is presented by arrangement with the George Balanchine Trust, and has been produced in accordance with the copyrighted Balanchine Style and Balanchine Technique Service standards established by the Trust. The feminine, flowing, and fast-paced performance featured highlighted roles for Mary Marshall and Molly Wagner, but all of the company performed this light, airy choreography with professional flair. 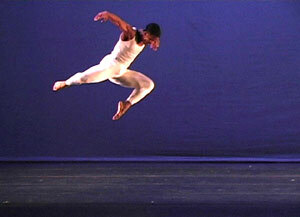 The dancers were profoundly proud of having the opportunity to perform this prestigious ballet. 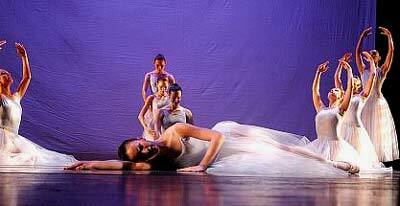 "It was a VERY special night for dancers," said Dance faculty member, Jennifer Medina. "The girls were so excited about our having been able to bring the Balanchine ballet to UMKC... they actually came off stage with tears welling up in their eyes ... they were so proud of having performed it so successfully." "We all had a good time," said ballerina Anna Acker, a senior in the Dance Program. "It is such an honor to do the classical Balanchine ballet... it is a mark of how much the Dance Department has grown just since I have been here as a student." The next piece featured a solo by faculty member, Medina, titled, "Facades of an Indeterminate Nature", performed to music composed by Patty Griffin. The choreography seemed to suggest feminist themes that characterize Medina's work. Next on the program was a sextet piece, "Pillars", choreographed by Mariko Kumanomido to music, "The Farmhouse", composed by Barrington Pheloung. The sextet was an all female cast consisting of Rachel Barnes, Brittany Feiten, Jessi Fouts, Katie Metzger, Jennifer Phillips, and Chelsea Shaw. This was a pleasing abstract, barefoot Modern piece performed in simple earth tone leotards, bathed in fire-colored lights. 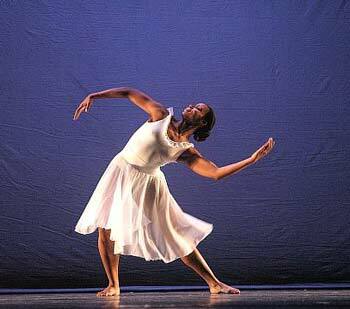 The show closed with a repeat performance of "Torn but Tender", choreographed by faculty member, Rodni Williams. The piece featured a solo bit performed impressively by Alexandra Keys, and a male trio consisting of Ron Belger, Anthony DeCarlis, and Terell Lampley. The final movement was a great crowd pleaser, and featured the entire female ensemble performing to Otis Redding's "Try a Little Tenderness", which brought down the house in thunderous applause. 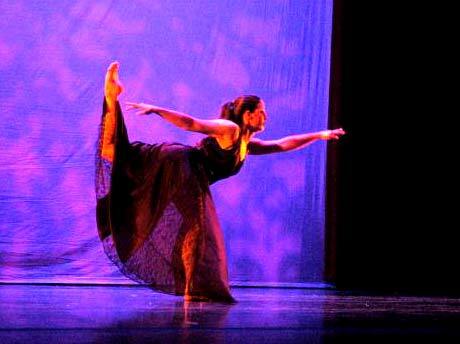 "It was an amazing show," said Dance alumnus Holly DeWitt. "I really enjoyed the Balanchine ballet in particular... it was so beautiful, and I had never seen it before... It was my favorite piece in the whole concert." After the performance, there was a short reception in the lobby to acknowledge the concert marking the kick-off of the Conservatory's yearlong 100th Anniversary Celebration. Speakers included James Jordan, Ballet Master of the Kansas City Ballet, Mary Pat Henry, Conservatory Dance Division Director, and Conservatory Dean, Randy Pembrook. Jordan acknowledged the recent loss of Tatiana Dokoudovska and her contribution to the Conservatory and the Kansas City Ballet. 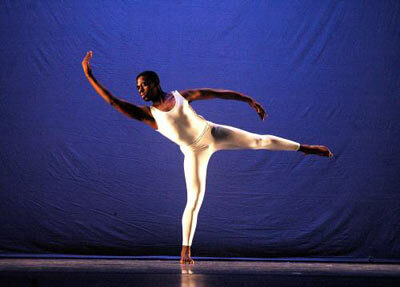 He also gave similar tribute to Ms. Shirley Weaver for establishing the Dance Department's level of excellence. He mentioned the contributions of a number of dance faculty over the years, including Paul Chambers and Cliff Kirwin, who contributed to the development of the Modern Dance subdivision. He also gave recognition to Mary Pat Henry who has built up the Dance department into its current level of enrollment and excellence. Dean Pembrook acknowledged that the Dance Division has grown by 50% in the last year or two, and that the Dance faculty has been expanded to accommodate the growth. He also made a particular point to highlight the fact that the Conservatory includes both music ...and dance. "We have a very supportive Administration here," said Medina, who was one of the Dance faculty's recent additions. "We are very lucky." The Dean introduced Dance Division Director, Mary Pat Henry, to give the final words of the reception regarding the future of the Dance Division. "We are very excited about the future," said Henry. "And we look forward to what the next 100 years will bring to the Conservatory... the Conservatory of Music ...and Dance." The Conservatory will be having a concert representing all the divisions for its 100th Anniversary Celebration Weekend, held April 21-22. 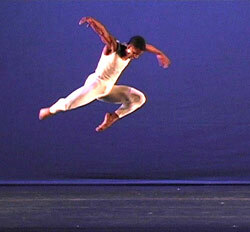 During the activities, the Dance Division will repeat the performances presented during its Spring Concert. The Celebration Weekend concert will present Stravinsky's "Symphony of Psalms", and will feature original choreography by Dance faculty member, Paula Weber.